We are a full scope eyecare practice dedicated to providing the highest quality vision care to children and adult in a friendly, comfortable, and professional atmosphere. With a highly trained staff and state of the art equipment, we go beyond 20/20! 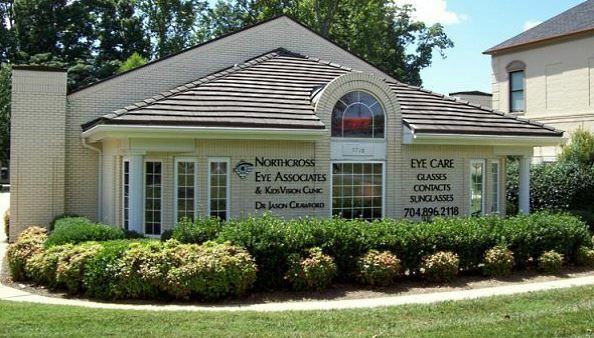 Doctor Jason A. Crawford of Northcross Eye Associates provides eye examinations and eye care treatments using the latest advances in technology in a family-friendly atmosphere. We care about each of our patient's visual health and utilize state-of-the-art systems to evaluate and appropriately manage eye issues associated with diabetes, hypertension, glaucoma, autoimmune disease, and many others. We take most medical insurances and vision plans. We'd be happy to perform contact lens consultations, computer vision evaluations and offer advice on refractive surgery such as Laser Vision Correction (LASIK). We offer the latest in fashion eyewear and sunglasses and are skilled in helping patients find the most flattering and functional eyewear to fit their lifestyles. Our office is located just off I-77, exit 25, Sam Furr Road and parking is always easy and available. Annual eye examinations are an important part of maintaining your best vision and eye health. Call or e-mail us for an appointment today. We're here to meet your eye care needs!